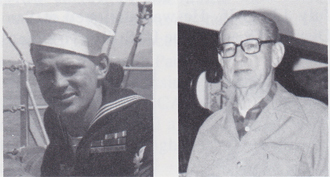 Donald Oscar Clingenpeel, Chief Boatswain's Mate, born Dec. 21, 1919, Sioux City, IA, joined the USN Sept. 9,1940. He spent nine weeks at the Great Lakes, IL, NTC, then went aboard the USS West Virginia (BB-48) sometime in October or November 1940 at Bremerton, WA. The ship went through an overhaul at the Bremerton Naval Shipyard. They arrived in Pearl Harbor in April or May 1940. He was in the 2nd Div. and subsequently assigned to the L Div. and later to the 3rd Div. On Dec. 7, 1941, around 0755 he was sitting on #5 mooring line on the starboard side. He heard some airplanes and saw the red balls on their wings. The Wee Vee was being shook by torpedoes and bombs. The ship was sinking and they were told to abandoning ship. He stepped into a motor launch and taken to Ford Island to a four-story building that had sleeping quarters, a PX, small stores, etc. A bomb landed and he was hospitalized for 10 days or so due to burns. He was then assigned to the USS Salt Lake City (CA-25). Discharged Nov. 8, 1960, he received the Purple Heart. He and his wife, Marjorie, live in Albuquerque, NM. They have three children and three grandchildren. He retired from the US Post Office and built doll houses until his eye sight became impaired. He is still able to work in the garden.